Plastic recycling of electrical appliances makes a lot of sense. Precisely how much sense this makes has been scientifically researched. A life-cycle analysis has been made by Patrick A. Wäger and Roland Hischier of the Swiss Federal Laboratories for Materials Testing and Research (EMPA) in St. Gallen. They looked at the supply cycle in two different directions and the two Swiss authors compared actual production data from the MBA Polymers plastic recycling plant, recycling mixed plastic fractions of scrapped electrical devices, with (1) the data for the production of virgin plastic materials, as well as (2) the data for energy recovery, incinerating these plastics. This comparison therefore gives a downstream and an upstream view. The study was a complete Life Cycle Analyses, looking at all effects of each of them on the ecosystem, on human health and on availability of resources. The LCA looking at the comparison between plastic recycling and incineration showed an overall environmental benefit of around four times in favour of plastic recycling. 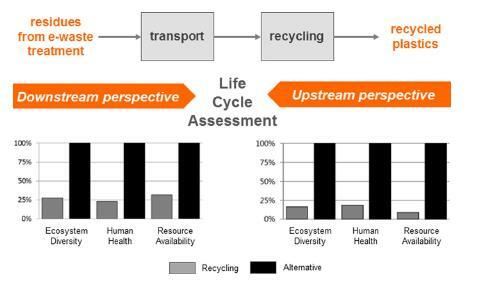 Scientific data and recycling alone do not suffice for the creation of a true circular economy. This has recognized the EU Commission, which formulated an ambitious action plan with many proposals. The current linear supply chain has a beginning and an end. A Circular Economy means that processed waste material is used again as a starting material. In order for this Circular Economy to break through, there are many issues that need to be addressed and these range from the harmonization and simplification of waste management rules, aligning them with product legislation, further initiatives to prevent the landfilling of waste, incentives for waste prevention, promoting better recycling up to the simplified cross-border traffic of materials to be recycled into secondary raw materials. As one of the crucial points, the European Commission identified that product design needs to change to become „Eco-Design“. This should result in products that are on the one hand designed so that they can easily be recycled and on the other hand that they can be produced from recycled secondary raw materials. Precisely at the point of the use of secondary raw materials – such as plastics from electronic equipment, as produced by MBA Polymers – there is a great need to catch up. 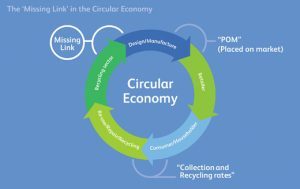 Here is the „missing link“ of the Circular Economy. Most OEM companies continue to rely on material from primary raw material sources. It is therefore crucial, that a better communication between manufacturers, designers and recycling company is promoted. The Müller-Guttenbrunn Group sees the European Commission’s Circular Economy proposals as very positive. „The proposed measures for the development of a Circular Economy provide important and proper initiatives. I am convinced that this package will help to create incentives for the recycling industry to further invest in and improve recycling technologies and we have formulated a few wishes with regards to the Circular Economy Package“, says MGG’s CEO Christian Müller-Guttenbrunn. Müller-Guttenbrunn has therefore defined a wish to Circular Economy package and is in this respect with colleagues, waste associations and other market participants in this week.